What is Allat? 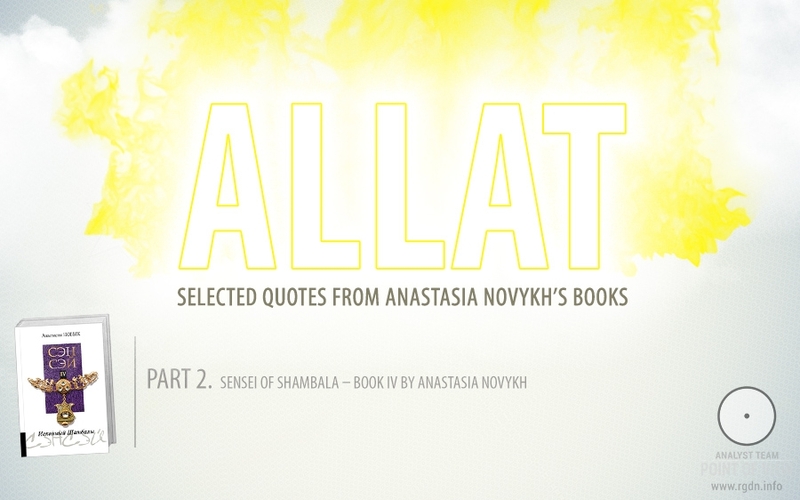 This material is based on Sensei of Shambala – Book IV by Anastasia Novykh. In remote antiquity this myth was known in North Africa (Ancient Egypt), in the interfluve of Tigris and Euphrates (the Sumerian civilization), among some tribes of the Eastern Mediterranean, in India, and even, no matter how strange it may sound, in the Urals and the delta of Ra, i.e. present-day Volga. According to Sumerian cosmology, at the beginning the whole world space was filled with ocean. In its bowels there was the Foremother of all things in existence, called Nammu. In her womb there appeared the cosmic mountain that gave rise to heaven (An) and earth (Ki). At that, the permanent epithet of Goddess-Foremother Nammu was ‘mother who gave birth to all gods’, ‘mother-creator of heaven and earth’. Another Sumerian myth tells that the danger of chaos appeared with the birth of Enlil. Let me draw your attention to the fact that the element lil means not only ‘wind’, but ‘a breath of air’. 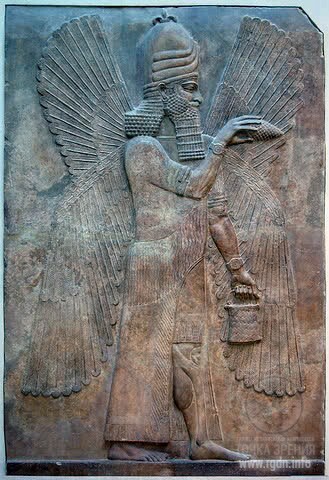 Sumerians believed that its aerial, so to say, substance was the first filler of space and the first carrier of motion. Sumerians used to have such notion as Allat, which later on was pronounced as Alad, initially meant ‘the omnipresent vital force’ and was eventually personified to the level of the vital force of a human being. Sumerians also had an interesting notion of Me that had once belonged to characteristics of Allat forces. In Sumerian mythology Me was considered to be powerful divine mysterious forces that had given more power and strength to gods who possessed them. According to ancient Egyptian beliefs, initially the world represented chaos – the primordial deep waters named Nun, from where all things in existence emerged. At that, modern translations mention three persons were united in it: the Creator of the Universe, the Lord of gods, and the spiritual force, or more simply God, Lotus and Allat. By the way, the Shambala sign consists of a lotus flower with a truncated pyramid and a triangle above it with an eye inside. The eye means the all-seeing eye of God, while the triangle means the union of all three principles of creation of the Universe… Knowledge about the creation of the Universe through explanation of the triple principle gave rise to a prototype of the trinity mentioned in many religions. Adapted to human perception, the trinity was first explained as a divine family: a Father, a Mother and a Son. But later on people removed the feminine principle and replaced it with a notion of the Holy Spirit, which has remained until today… The trinity in the meaning of God, Lotus and Allat represents that the union of all these three forces leads to creation of a completely new form of existence from micro- to macro-level. There is also an ancient Egyptian legend saying that the creator (Atum, Khepri) is inside of Nun and creates everything from Nun. By the way, khepri means ‘the one that appeared’ and originates from words ‘to appear’, ‘to arise’. As for Atum, at a certain time he was worshipped as the god of the sun, the creator of the world who had emerged from primordial chaos as a primordial hill. 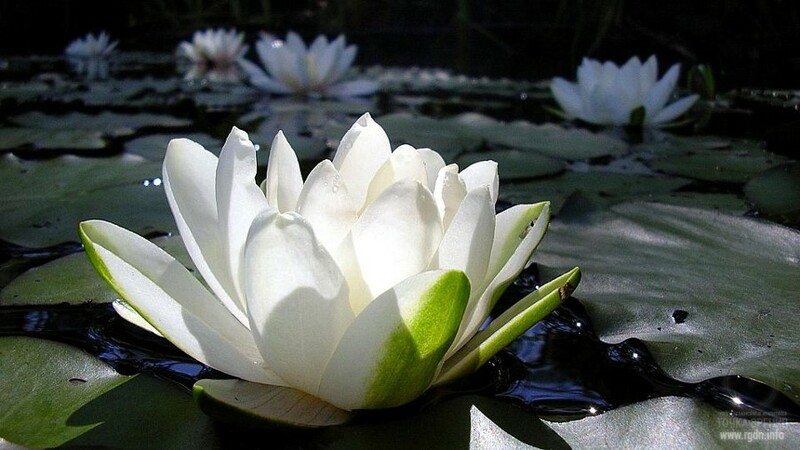 According to one of legends, a hill appeared from the primordial waters, and a lotus flower blossomed out on it. A beautiful child Sun-Ra appeared from there and ‘illuminated the Earth which had stayed in darkness’. Based on other interpretations of this knowledge, the emergence of the sun is associated with an egg laid by the ‘great Gogotun’ bird on a growing hill. In description of the creation of the world in the Book of Genesis one of ancient images is used, namely the vivifying descent of ‘God’s spirit’ to world waters; in the Judaic text this is depicted via a metaphor of a bird laying an egg. According to the Vedic worldview, in the beginning there was nothing. ‘The Single breathed without breath, and there was nothing except of it’. That Single closed in vacuum was born by the power of cosmic heat – Tapas which the Universe is based upon. The primary source of the created world was a desire. At the beginning there were cosmic waters. The Earth and the Sun appeared from a Lotus floating in those waters. 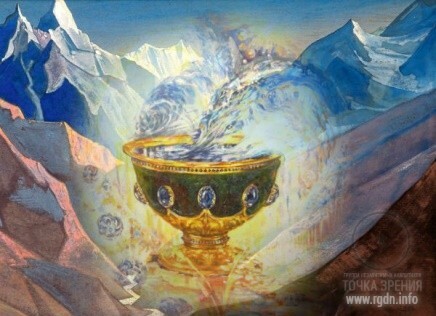 By another interpretation, a golden egg originated from the waters, from which the god-creator Prajapati emerged who supported earth and heaven, measured the space, gave life and force. Manifestation of Allat in the Vedas is also described through Purusha called as the ‘only one who includes all living beings’, the ‘parent of his parents’ who originated from a personified female goddess Viraj, being at the same time his daughter. It is also mentioned that he is omnipresent and all things in existence consist of him. 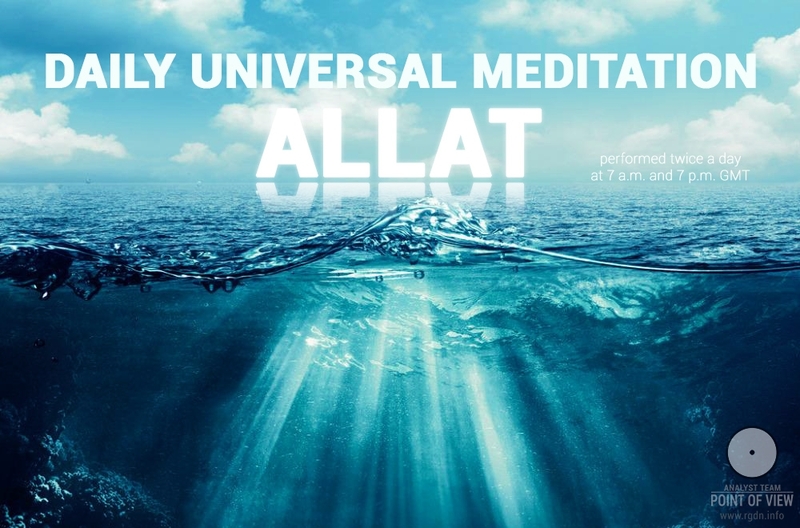 Moreover, Allat is described through goddess Aditi (the name originates from the ancient Hindu word á­diti meaning ‘boundlessness’) – the Foremother who gives birth to the whole world, to gods and humanity. She was associated with light that filled the air space. In olden times, the Arabs worshipped three goddesses – daughters of Allah: Al-Lat, Al-Uzza and Manat. 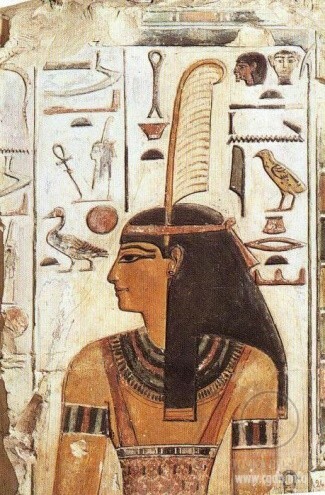 Al-Lat was also revered as a lunar goddess in North Arabia. As a crescent and a star, Al-Lat and Al-Uzza may now be seen on national flags of a number of Islamic countries. Their names are female forms of the name of Allah. 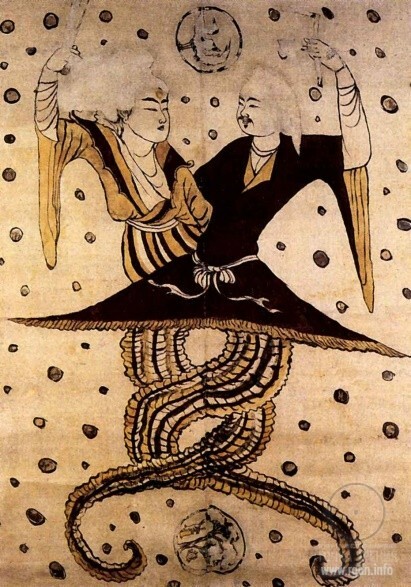 Records of Arabian goddesses have existed since pre-Islamic times. 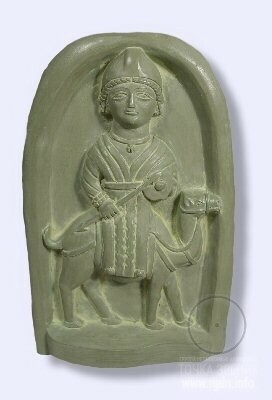 Epiphanius, the bishop of Cypriot Salamis, wrote in the 4th century AD that the Nabataeans worshipped virgin Haaba. 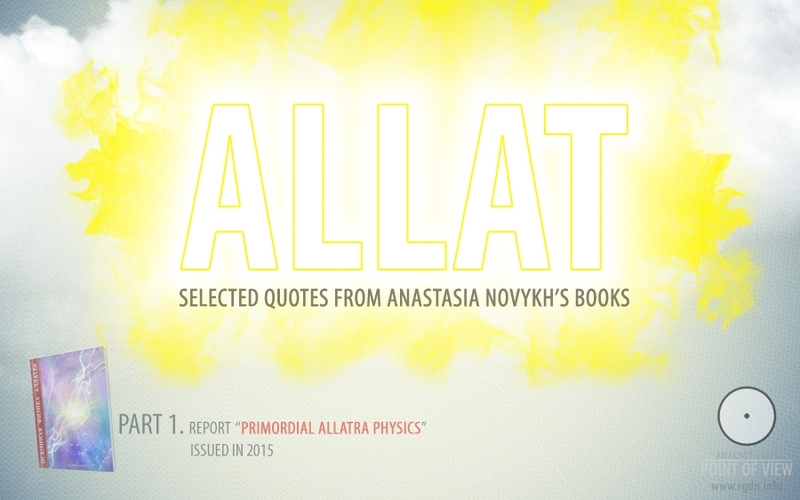 He also heard of the name Kaaba (‘a right-angled stone’) as a symbol of goddess Al-Lat. An Arabian scribe told him that local peoples worshipped a four-sided stone as Al-Lat who was called the Mother of Gods in Nabataean records. Epiphanius communicated that male deity Dusaarus (du Saar, or Dionysus according to the Greeks) was a son of virgin Haaba. Babylonians called goddess Al-Lat – the ‘Mother of Gods’ – Ilet Ilauni (the Queen of Gods or the Mother Goddess). Moreover, Epiphanius identified Haaba with goddess Kora who was called Ashtar by the northern Semites and Ishtar by the Babylonians. 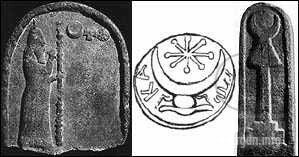 The above image depicts a (male) lunar deity Hub-Al, also referred to as Vaad (the Beloved). 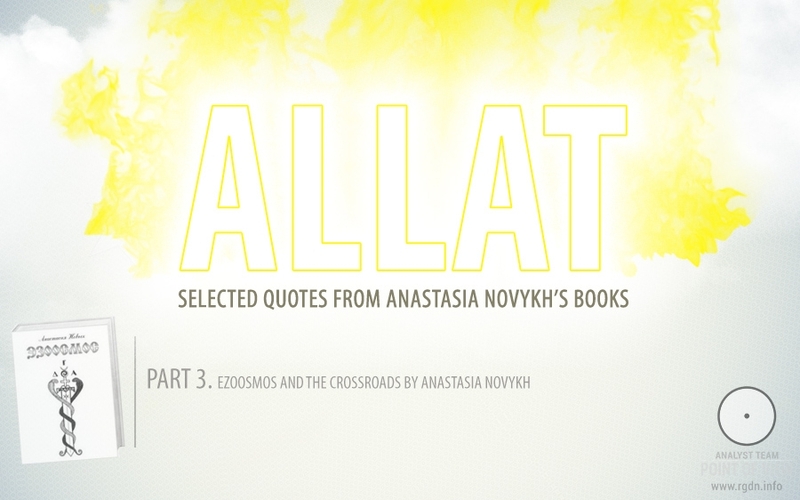 Al-Ilat or Al-Lat (goddess) was believed to be Allah’s daughter and the owner of Kaaba in Mecca. Venus (Al-Uzza) and a rising, growing moon (crescent) are still the symbols of Islam. Furthermore, Maqam e Ibrahim located near Kaaba in Al-Masjid Al-Ḥarām (the Sacred Mosque) is still crowned with a symbol of growing moon. 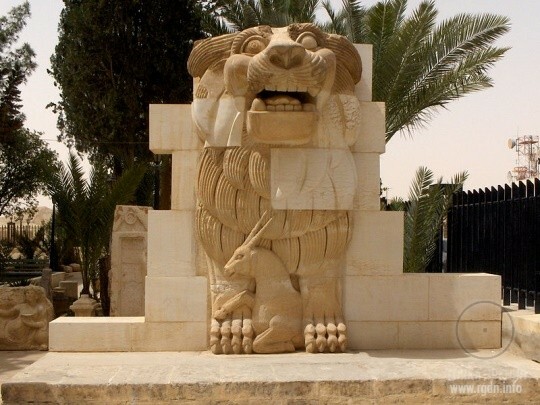 Until recently, in Syria there was the Lion of Al-Lat – an ancient statue of a lion holding a crouching gazelle, which used to adorn the temple of pre-Islamic goddess Al-Lat in Palmyra. The statue was made of limestone in the early 1st century AD, had 3.5 metres (11 ft) in height and weighed 15 tons. The lion was believed to be the husband of Al-Lat. The gazelle symbolised Al-Lat’s tender and loving traits as bloodshed was not permitted under penalty of Al-Lat’s retaliation. The lion's left paw had a partially damaged Palmyrene inscription that read: tbrk ʾ[lt] (Al-lāt will bless) mn dy lʾyšd (whoever will not shed) dm ʿl ḥgbʾ (blood in the sanctuary). Unfortunately, on 27 June 2015 the statue was demolished by the Islamic State of Iraq and the Levant after it had captured Palmyra. The statue has since been moved to the National Museum of Damascus where it is undergoing restoration works. 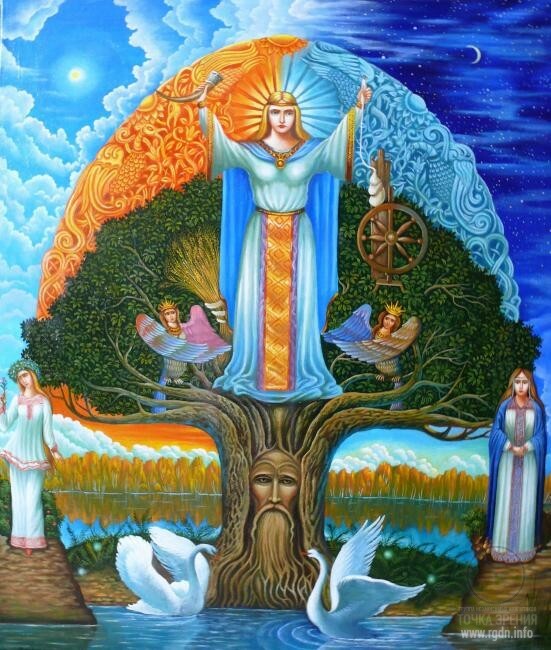 In the East Slavic mythology, the patroness of the feminine principle, destiny, fertility, water, spinning and weaving (also called the invisible Great Spinner of the World) was goddess Makosh (Mokosh). One of her attributes was a cornucopia, a crescent with its horns pointing upwards. 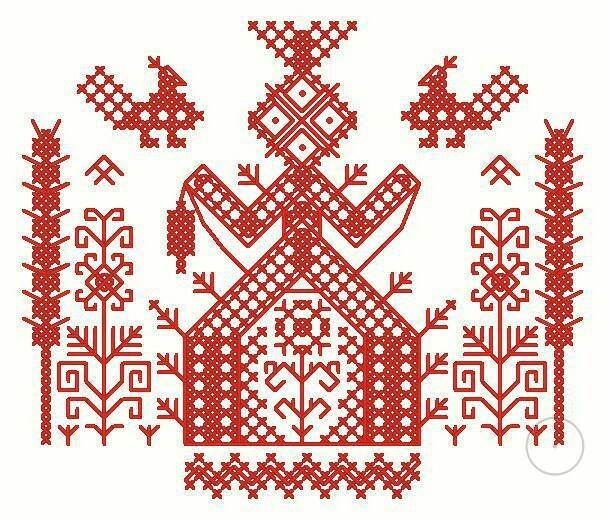 It is worth mentioning that back in pre-Christian times East Slavs had unique ancient knowledge of the universe and man, of signs and symbols. All that was engraved in their culture and beliefs, as well as in architectural structures of Slavic temples and chapels (Note: more information may be found in the AllatRa book). They knew about the creation of the world as a process similar to the process of creating a yarn or cloth: the world is “twisted” like a yarn, “wrapped” like a warp yarn or “weaved” like a cloth. How this ancient knowledge was destroyed and the new worldview of priests was imposed and politicized, one can judge by the fact that in the 12-14th centuries almost all sermons against paganism contained the name of ancient Makosh. 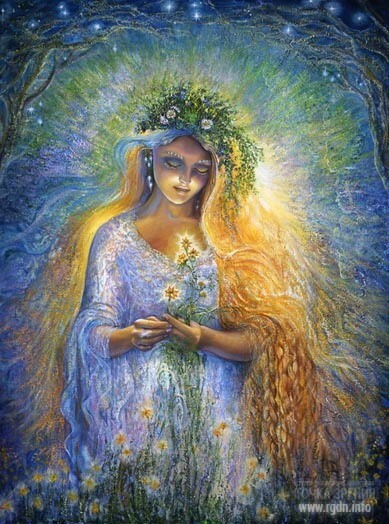 Makosh was an important goddess of the old Slavic pantheon, who was among seven main gods. The meaning of her name Makosh, or more precisely Ma-kosh, is very interesting. The etymology of this word is said to be connected with the root that denotes “spinning, yarn”. In Sanskrit there is a word moksha (moksa) which means “liberation” and is still used in Indian philosophy and religion as a concept of spiritual liberation. In the name Ma-kosh, taking into consideration the old Indo-European age of the word Ma, the first word means “Mother” (the Great Mother who gave birth to the world, the Goddess of Destiny), while the word kosh in the Old Slavic language means “a wattled basket”, a braided cart for sheaves (known since the times of the Eneolithic – the 4-3rd millennia BC), a storage container for grain. Moreover, the phrase “my lot” (meaning “my fate”, “my destiny”) meant “my cart of sheaves”, “my basket of grain”. At that, taking into consideration the ancient associative symbolism of these objects and plants associated with explanation of the process of creation, it is clear that the phrase had a non-material meaning, e.g. the phrase “my basket of grain” meant “my spiritual good”, “my spiritual value”. In mythology of peoples of the world grains represent an ancient symbol of birth, resurrection, revival of the world; and from the perspective of human spiritual evolution the grain symbol means formation and establishment of spiritual life in a human being, where the highest values are achievement of non-material goods, spiritual growth and improvement within one’s lifetime, i.e. conception of eternal spiritual life during the short-time existence of a cover – a body. That is why the initial image of the goddess, patroness of full baskets, as of the Mother of true Happiness (liberation) had a completely different meaning associated with non-material human values. Po particle is an element of the primordial chaos. Let’s assume that a Po seed is sand. Allat is a force that created a stone of this sand according to the plan of the Primary Lotus. The final outcome, i.e. the perfect shape and beauty of the stone, is a manifestation of Lotus. 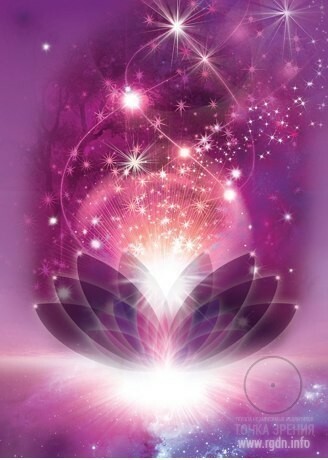 That is, with respect to the Universe Po particle is an integral part of everything, Allat is what created the initial matter and puts everything to order, making it move, shift and transform according to a certain plan of the Primary Lotus, whereas Lotus itself is manifestation of divine harmony and beauty. Manifestations of Allat in this world would be senseless without Lotus as the highest spiritual principle. At that, without Allat there would be no manifestation of Lotus in this world at all. 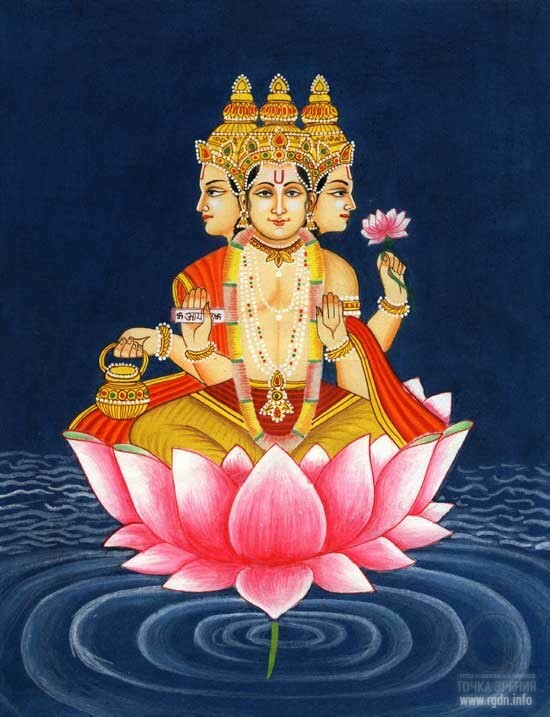 Lotus embodies addition of highest spirituality to the material world, while Allat is a spiritual force capable of forming matter. Any matter is senseless without spirituality and mind. For instance, a painter plans to draw a picture. This is manifestation of Lotus action. Then he draws a picture. He draws it in order to embody his spiritual state in colours, adding a part of his soul to his work. He draws it not for himself but for people, for them to evaluate his picture, to feel what he has put into it. That is, this act of creation is a sort of embodiment of a spiritual state in the material world by means of Allat, as a consequence of Lotus manifestation. Starting from the purchase of canvas and paints, and up to finding a subject and fixing a frame – all of this is Allat. Moreover, Lotus starts to act at the stage of a subject appearing on the picture, i.e. at the very moment of transfer of thoughts into the real image. Perception of that beauty, of that spiritual side implied by the painter, is Lotus. Therefore, if there were no Allat, there would be no Lotus, while Allat is senseless without Lotus. At that, without Allat in this world there would be no Universe as such. There would be only the world of God with its pure spirituality – the highest Lotus, and the original form of Allat completely different from that in matter. There is nothing beyond the sphere of Allat action. As a matter of fact, if there is something in this world that something may exist only owing to Allat, and where there is no Allat there is nothing. Once the expanding Universe reaches certain limits, i.e. when galaxies scatter certain distances away from each other, and the force of Allat weakens, Allat will disappear from this world as a force. Once Allat disappears, everything will disappear together with it, including matter, time and space. There will be even no void, because birth took place from nothing, and it will turn into nothing again. This is the phenomenon of the Universe and Allat itself. For as long as Allat is in force the collapse of one matter or energy leads to creation of another form of matter or energy. It is just a transition from one state into another, or, to put it more precisely, the fluctuating constancy of Allat. All planets, galaxies, even stones, which you consider to be of inorganic nature, are in fact alive, not to mention biological, rational beings. At that, all kinds of matter have their own life. Furthermore, all of them consist of atoms as well as of electrons that move around nuclei. As a matter of fact, all kinds of matter, both organic and inorganic, represent only various combinations of a certain number of elements that after a certain period of time, owing to Allat, turn into another state of matter, and nothing else. In the nearest future humanity will face another phenomenon of the Universe. Due to increasing acceleration of the Universe and exhaustion of the power of Allat, mankind will feel fast compression of time. This phenomenon will indicate that conventional twenty four hours a day will remain as they were in the past, but time will pass much more quickly, and people will feel such striking compression of time periods both on physical and intuitive perception levels. Allat has multiple manifestations. In scientific understanding allat is a single unit of time, which has a great importance for entire matter. If we take modern earth time values, an allat makes up 12 minutes, or more precisely 11 minutes 56.74 seconds. When scientists get to the notion of this important unit of foundation, so to say, the main building block of the Universe, there will be not just a grand revolution in science, but an evolutionary leap. 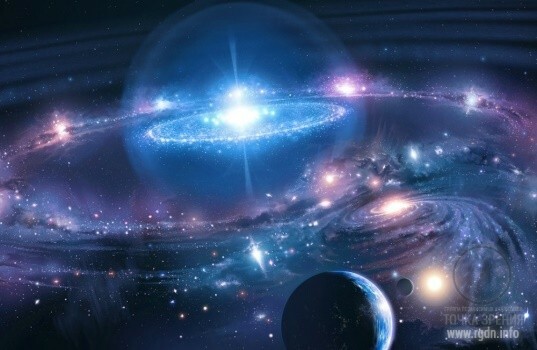 Then scientists will understand what is hidden under the secret of time and, having realized that, they will reveal the true process of matter formation in the Universe. If people get to know the essence of Allat, they will get enormous opportunities. The feminine nature (principle) contains a source of vital force. It may be opened only spiritually, in expression of the highest grade of Love. So, when opened, an enormous power manifests itself, which may be used for good things. It also enables a person to get in touch with Nirvana. Why did many peoples bind this source of vital force with immortality in their ancient legends? Because it’s the generative power of Allat! The source of this vital force was used upon the initial creation of the world, upon creation of living beings of the Universe, upon creation of the Earth and its main creative force – the water. Owing exactly to this source of vital force, a woman was created as the first representative of humankind. Only much later the first man was born from a woman, and this may well be proven. As genetics develops, sooner or later scientists will discover that female chromosomes are much, much older than male ones. Due to this fact, people will eventually make even more important discoveries in genetics and understanding of human evolution. Furthermore, even now it’s not a secret that during the first weeks after conception a human embryo (whether it belongs to a future man or woman, which is determined by the genetic code) develops as a female individual!